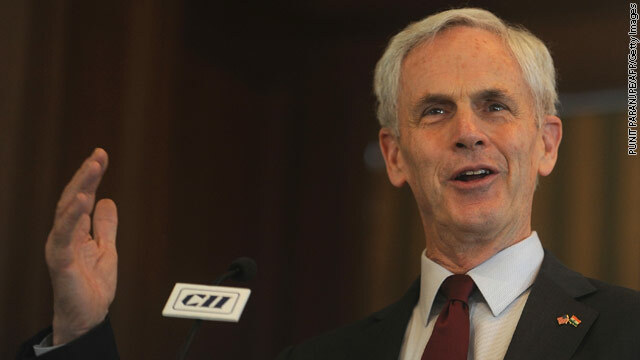 Commerce Secretary John Bryson speaks during a session organised by the Confederation of Indian Industry in Mumbai on March 29, 2012. WASHINGTON (CNN) – The protection of intellectual property is vital to virtually every aspect of the U.S. economy, according to a new report released by the Department of Commerce. The report, titled “Intellectual Property and the U.S. Economy: Industries in Focus,” highlights many industries and exports that intellectual property supports, concluding that nearly every sector of the U.S. economy relies on or uses some aspect of intellectual property. IP refers to the creative processes of innovation and introduction of new ideas into the economy. It includes patents, trademarks, and copyrights but also extends to ideas and the creation of words, phrases, and designs. According to Commerce Secretary John Bryson, industries affected by intellectual property account for more than 40 million jobs, 61% of exports and more than $775 billion in goods and services. At an event in Washington DC on Wednesday, Bryson said that protecting these rights is key to keeping the United States competitive. According to the report, more jobs in IP-related fields have been created than in other fields and those jobs pay 42% higher in wages. Also participating in the event held at the Eisenhower Executive Office Building were Thomas Donahue, Pres. and CEO of the U.S. Chamber of Commerce, and AFL-CIO President Richard Trumka. Both groups praised the report, saying that protecting innovative ideas is an issue critical to the overall recovery of the economy and job creation. Trumka added that protecting intellectual property is only one part of the solution. Other measures must also be taken to prevent abuse from abroad. “At a time of high long-term joblessness, we must employ U.S. workers to use U.S. intellectual property in the United States. If we don’t, we will lose the stimulus to innovation that hands-on experience supplies,” Trumka said. Good to hear the importance of protection of creativity & ideas is top of the USA government agenda and recognised as a driver of innovation and job creation. One element not mentioned however is that 'ideas, creativity & innovation.concepts' are not protected under any nations formal/traditional IP mechanisms until the innovations have been commercialised. And yet the vast majority of 'creators' seek to license their work or sell their IP generated in the concepts to businesses better positioned to bring them to market – and that is the area where the majority of Creators (& where 85% of innovation is not subject to patent) are at their most vulnerable from misappropriation by other businesses who invariably go on to profit from the Creators work without a fair or often any remuneration. And in recent months Creative Barcode has entered into partnerships with USA social ideation and crowd sourcing portals http://www.ahhha.com and http://www.geniouscrowds.com – both of who use the Creative Barcode authentication, protection & safe-disclosure mechanism to protect their Creators concepts during the development & negotiation stages. A good place to start is to reduce the complexity and cost for the many 1000's of individual Creators and micro-sized companies and increase corporate responsibility towards fair play during negotiation and licensing stages. Only then will innovation truly open up – currently the IP systems restrict innovation not support it.